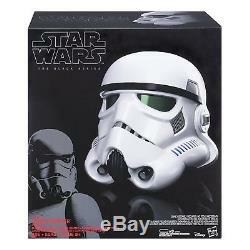 The Black Series Imperial Stormtrooper Electronic Voice Changer Helmet. Jedi Knights, Sith Lords, Stormtroopers, X-Wings, Star Destroyers, AT-AT Walkers, droids, Wookiees, Rebel heroes, and more! Discover the exciting stories of good versus evil in a galaxy far, far away with The Black Series Imperial Stormtrooper Electronic Voice Changer Helmet from Star Wars Rogue One. Defend the Empire under the helmet of an Imperial Stormtrooper with this electronic helmet that transforms you into a loyal Imperial soldier! With a push of a button, your voice changes into that of an Imperial Stormtrooper, the faceless legions of soldiers serving the Galactic Empire who, encased in white armor, are loyal Imperials who undergo rigorous training. Re-create the most embattled, most intense moments of adventure from Star Wars: Rogue One with this movie-accurate reproduction Imperial Stormtrooper Electronic Voice Changer Helmet! Build your Star Wars collection with this authentic and highly detailed Imperial Stormtrooper Electronic Voice Changer Helmet that is a true- to-story replica of an Imperial Stormtrooperâ?? S helmet from Star Wars: Rogue One! With characteristic design, multiple points of articulation, and realistic features across figures, vehicles, helmets, lightsabers and more, The Black Series embodies the quality and realism of the Star Wars saga that is loved by Star Wars devotees young and old. Collect this and other elite products from Star Wars The Black Series, and commemorate moments of battle from Star Wars: Rogue One with the Imperial Stormtrooper Electronic Voice Changer Helmet from Hasbro Star Wars. Star Wars products are produced by Hasbro under license from Lucasfilm Ltd. Hasbro and all related terms are trademarks of Hasbro. Collector-grade quality, part of the Black Series collection. Realistic detail and movie-accurate reproduction. Electronically change your voice to sound like an Imperial Stormtrooper. X3 1.5v AAA ALKALINE BATTERIES REQUIRED. Product Dimensions: 8.5 x 10.8 x 12.5 inches. Item Weight: 2.5 pounds. We are small, family owned business that was established in 2008. We specialize mostly in electronics and toys. However, we also have a wide variety of products including household items, cosmetics, sporting goods, games, DVDs, tools, pet accessories and more. Our main goal in business is to show integrity and to make sure our customers are satisfied with the service and products they receive. NEW items that have been opened or used are non-returnable unless defective/DOA. Please notify us with any problems and we can resolve them before further action should be taken. Feedback And Questions Are Always Welcome! The item "Star Wars The Black Series Imperial Stormtrooper Electronic Voice Changer Helmet" is in sale since Wednesday, May 23, 2018. This item is in the category "Collectibles\Science Fiction & Horror\Star Wars\Products, Non-Film Specific\Costumes, Masks". The seller is "jjsrealbuy" and is located in Kingston, Illinois. This item can be shipped to United States, Canada, United Kingdom, Denmark, Romania, Slovakia, Bulgaria, Czech republic, Finland, Hungary, Latvia, Lithuania, Malta, Estonia, Australia, Greece, Portugal, Cyprus, Slovenia, Japan, China, Sweden, South Korea, Indonesia, Taiwan, South africa, Thailand, Belgium, France, Hong Kong, Ireland, Netherlands, Poland, Spain, Italy, Germany, Austria, Bahamas, Israel, Mexico, New Zealand, Philippines, Singapore, Switzerland, Norway, Saudi arabia, Ukraine, United arab emirates, Qatar, Kuwait, Bahrain, Croatia, Malaysia, Brazil, Chile, Colombia, Costa rica, Dominican republic, Panama, Trinidad and tobago, Guatemala, El salvador, Honduras, Jamaica, Antigua and barbuda, Aruba, Belize, Dominica, Grenada, Saint kitts and nevis, Saint lucia, Montserrat, Turks and caicos islands, Barbados, Bangladesh, Bermuda, Brunei darussalam, Bolivia, Ecuador, Egypt, French guiana, Guernsey, Gibraltar, Guadeloupe, Iceland, Jersey, Jordan, Cambodia, Cayman islands, Liechtenstein, Sri lanka, Luxembourg, Monaco, Macao, Martinique, Maldives, Nicaragua, Oman, Peru, Pakistan, Paraguay, Reunion, Viet nam.